Download a FREE copy of The Star Trails Compendium from one of the links below to obtain all the background information on Cyraria found elsewhere on this site, including the section for educators, in convenient ebook format. Explore the reasons for the planet’s extreme weather as it orbits a binary star system in a figure-8 pattern known as a lemniscate. Learn more about its political structure and indigenous race, the bnolar. 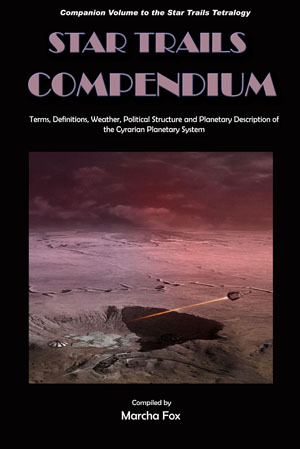 The glossary of terms and definitions includes Star Trails’ unique words as well as short explanations of some of the scientific principles involved in the stories. The BONUS SECTION FOR EDUCATORS contains book by book and chapter by chapter discussion and lesson plan ideas, based on the science inherent in the plots of the Star Trails Tetralogy. Educators who place this series on their reading list to stimulate advanced students’ interest in science, math, physics, and engineering, can then follow up with ready-made assignments with minimal effort.